Starcraft 2 custom map, available on Battle.net. Stranded On Krydon is a Starcraft 2 custom map developed using Blizzard's Map Editor. Stranded On Krydon is a 4-player cooperative survival game; the player controls a single SCV, a survivor of a colony ship which crash-landed on Krydon, a planet infested by the Zerg. The player must explore the planet, find and harvest resources, discover abandoned structures to unlock new technologies and defend against increasingly powerful waves of Zerg. Stranded On Krydon's core gameplay revolves around exploration and discovery; in order to make the map highly replayable, everything on the map is placed procedurally. Resource nodes, enemy bases, supply caches and so on populate the map in new areas each playthrough. As players explore further and further from their starting location, enemies become more dangerous, but rewards become appropriately better. The map's difficulty is highly malleable by player choice. Players first vote on a difficulty setting, either Normal or Brutal, the latter being intended as an extreme challenge meant for veterans of the game. Experienced players can make the map more challenging for themselves by immediately heading for the edges of the map, where the best rewards and the strongest Zerg spawn; newer players naturally tend to explore more slowly, allowing them to learn the game against weaker enemies. The map also adjusts for the number of players in the game, allowing for players to play alone or with one or two friends without penalty. To make playing with strangers more enjoyable, Stranded On Krydon rewards cooperation among players but doesn't enforce it. Players can explore independently of one another and survive on their own, but will be stronger and safer together; for instance, a downed survivor can be repaired by another survivor, making traveling in pairs an attractive proposition. Structures are also "shared" to a certain extent, in that a player can return resources to an ally's base, build units using shared buildings and benefit from abandoned technology that any player discovers. Stranded On Krydon offers several ways to win. Players can build Rescue Beacons in order to send a distress signal, which eventually attracts a Rescue Ship. Players can also build their own Rescue Ship, which is much faster but requires a large sum of resources. Finally, if players survive for long enough, the Protoss will eventually appear and attempt to incinerate the entire planet. 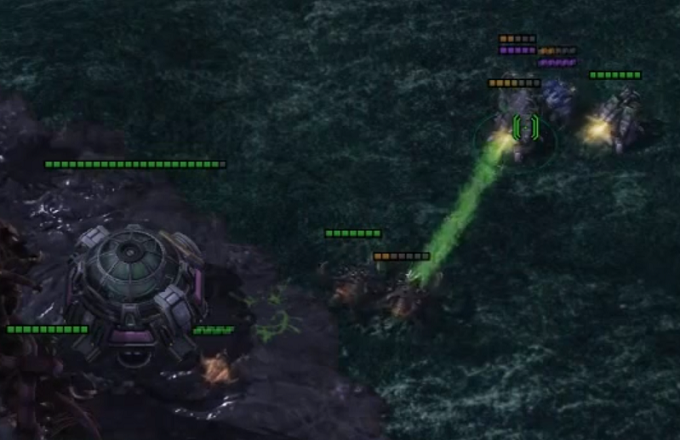 If the players can defeat the Protoss, the players win.